Does Julia Cameron Blow Bubbles with Fubbles? Part 1 of Artist Date. Buy bubbles. Off to Toys R Us, which I haven’t been to for at least 10 years, I’m sorry to say, because it is an awesome place. The good news is you can still buy bubbles for $1. The bad news is that they now sell dozens of bubble-blowing products that require batteries. Jar one: Sponge Bob bubbles—The same formula and bottle type used by cavemen. 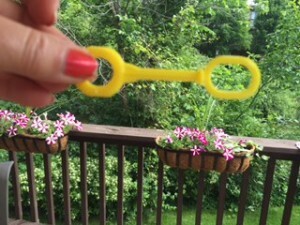 About 5 or 6 little bubbles when you blow into the little wand you remember from being a kid. 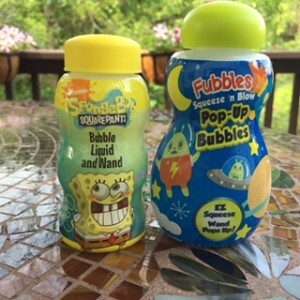 Jar two—Fubbles Squeeze and Blow = Pop-Up Bubbles. You squeeze the bottle and the little wand pops up. Theoretically you don’t get bubble slime all over your manicured digits. Blow and learn. Fubbles works really well! Dozens of bubbles. Watch them float onto your tan house, your pink flowers, your brown deck, your blue jeans, all bubbles are in technicolor. I love this poup innovation! It was totally worth the extra dollar. Fubbles blew me away! Have you taken an artist date lately? What did you do?